Want to add a little holiday cheer to your living space without breaking the bank? Get a clear glass bowl, fill it with extra Christmas ornaments or clementines, and you have an instant holiday-themed centerpiece for your table. Ta-da! Illustrated below are 8 more DIY holiday decorating ideas to bring some seasonal joy to your home—Christmas tree and Christmas lights not required. 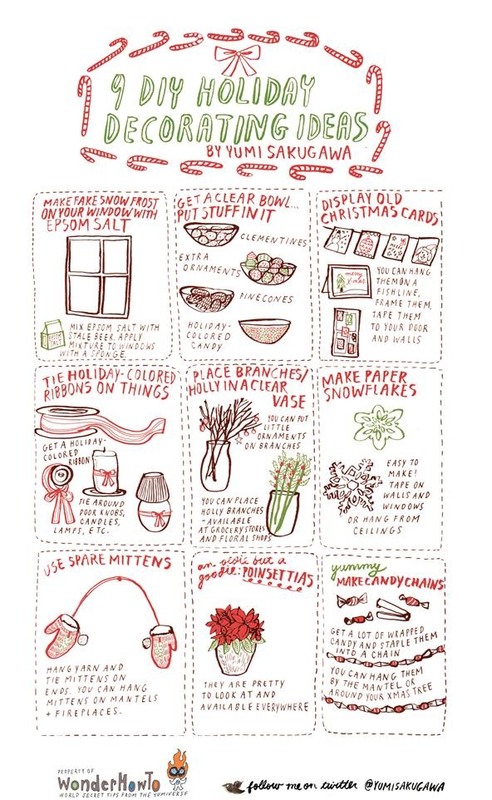 Fore example, use epsom salt too make your windows look snowy, display old Christmas cards on a string, decorate all your belongings with holiday-themed ribbons, and more! Got your own DIY holiday decorating tips? Share with us below.